Working with families who struggle to feed their children on a daily basis, I often hear, “Your kids must be great eaters!” or “I bet you don’t have any trouble at the table with your kids!”. Well, let me tell you, it isn’t quite that simple. As a feeding therapist, I am confident that what I am suggesting to parents will at least help, and not hinder, their child’s progress with eating. When I am working with someone else’s child, I can see their issues objectively. That makes it fairly easy to navigate next steps and to tease apart what may be going wrong. I have done loads of research and reading on the topic, wrote a book, and provide therapy for children from newborns to teenagers. I do trainings for other therapists, physicians, and students. So you would think I would have all the answers with my own three kids, right? Not so much. At home, things are a little more complicated. Do my kids sit at the table and eat at most meals? Yes. Are mealtimes a beautifully harmonious experience where all three of my children eat complicated dishes with a smile on their face? Hasn’t happened yet- I am still waiting. 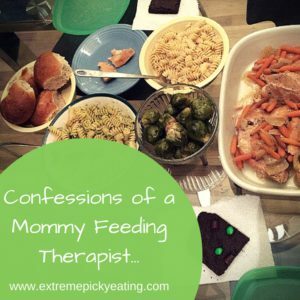 So what does a feeding therapist’s family mealtime actually look like? Setting: We eat at our kitchen table for all meals, using family-style serving. I do a lot of “pile-on” and deconstructed meals and we don’t pre-plate the kids’ food. I work full-time and the kids have lots of activities, so our meals are fairly simple, and I get take-out about once a week. I rotate approximately 10-15 meals that I know I can throw together in 45 minutes or less. Everyone serves themselves. Sometimes we have music playing, sometimes not. When we have dessert, it is one serving with the meal and they don’t ask for more because we have been doing it this way forever. The food that goes on each plate is hugely different from one kid to the next, but usually, everyone gets enough of what they want. None of my kids eat cooked vegetables, only raw, and only a select few. There is a lot of squabbling and kicking siblings under the table. Hands are much preferred over utensils. Drinks get spilled. Food gets dropped on the floor. We deal with it. I often drink a glass of wine. Kid A: 10 years old, was an adventurous eater until about age 7. Pretty laid-back and doesn’t get stressed about stuff. Currently complains about almost every meal served unless his favorites appear. Really interested in soda which we have occasionally (Root Beer or Sprite- no caffeine is my rule) to keep the soda from landing on a pedestal, and loves sweets and salt. He sits sideways in his chair (until I ask him to sit properly) and makes a mess while eating and doesn’t really care. Most of his meals consist of meat and carbs with the occasional raw carrot, edamame, or Caesar salad thrown in for fun- oh, and butter. Lots of butter. Kid B: 7.5 years old, has always been a selective eater. Anxiety peaked at about age 4, when he would physically shake if anyone put an unsafe food on his plate (read: well-meaning extended family/friends). We used DOR (Division of Responsibility) and our STEPS+ methods with him from day one, and now he adds new foods into the rotation about 1-2 times per month. Still very picky, but has a wide enough variety for good health and has a big appetite. He doesn’t get super anxious very often around food unless he feels that someone is going to make him eat something, but he has learned to speak up with a “No thank you”. He is probably on the sensory seeker side of things: loves strong flavors (when he will try things), enjoys crunchy foods way more than soft ones (mashed potatoes made him gag the one time he tried them), and needs to move before he can sit down to eat. I often joke with my husband that the grapes in his lunchbox enjoy taking a ride to school every day but never get eaten (but he eats them at home). Kid C: 3.5 years old, was a pretty adventurous eater until about 2. Spent the last year wanting “melty cheese” on everything, mostly on tortilla chips or taco shells. Eats a variety of fruits and a handful of raw veggies, and has a wildly different appetite from one meal to the next. Often eats the equivalent of one Mandarin orange for dinner. She has been serving herself since she could sit at the table with us (about 20 months), so she gets REALLY upset if anyone puts food on her plate. She often tries something and then decides it looks better on my plate. Her first answer is always NO when food is getting passed around, but typically will ask for other food once it has been sitting in front of her for a while. Recently, she has been asking for bites of new things (spicy tuna roll!) and seems to be creeping, albeit slowly, out of her typical picky eating neophobia stage. So, you may be asking: why should I listen to someone whose own children aren’t perfect eaters? Because I get it. I understand the frustrations with behavior, anxieties about good nutrition, and worry about what is going to go on the table. It is HARD. As parents, we have no idea what kind of temperament each of our children will have, how their skills will develop, or if they will have delays or issues that we don’t know how to deal with. Because of what I do, though, it is easier for me to see my kids’ preferences as just that– preferences, each rooted in some sensory or temperamental trait. Them not liking or eating something doesn’t become a personal failure for me. It is what it is, and it often is just a phase- or developmentally appropriate. And I want that understanding and confidence for you. Our book was written to help you understand your child better and to help you facilitate improved feeding skills and a more trusting relationship with food. P.S. I will keep you posted if that beautifully harmonious mealtime ever does occur! Find the tips and strategies I use in our book, Helping Your Child with Extreme Picky Eating.